the nytpicker: Why Is This Man Laughing? NYT Slaps Misleading 5-Month-Old Photo Of Iranian President Across Three Columns At Top Of Today's Front Page. Why Is This Man Laughing? NYT Slaps Misleading 5-Month-Old Photo Of Iranian President Across Three Columns At Top Of Today's Front Page. Today's lead page-one story about Iran's use of tunnels to hide its atomic materials was a legitimate scoop -- an inside look into the country's secret, ongoing nuclear efforts. But when it came to illustrate it, NYT editors grabbed a five-month-old agency photo -- one that had absolutely nothing to do with the story -- and slapped it across three columns at the top of today's front page. In fact, today's page-one photo was taken last June 29. 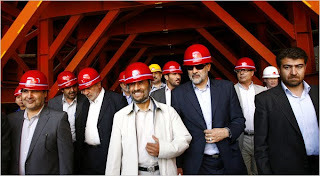 According to caption information on the website of Getty Images, which owns the photo, it shows President Mahmoud Ahmadinejad visiting "the construction site of a tunnel on the road between Tehran and Chalus, northwest of Tehran." In other words, it's a highway tunnel -- not at all the sort of secret tunnel described in reporter William J. Broad's story. It's also a blatant attempt to mislead readers into thinking a photographer has captured the Iranian president -- smiling -- as he inspects his country's secret stash of nuclear weapons. This represents another sorry example of the sloppiness that seems to have pervaded the NYT in recent days. Just last Sunday, the Styles section ran a nearly three-year-old photo of a famous, now-dead painter to accompany a story about nightclub smoking. Given the incessant bragging the NYT does about its continued commitment to first-rate international news coverage, you might think its photo editors --charged with the task of finding a front-page picture -- might do more than type the words "Ahmadinejad tunnel" into a photo agency search engine. "President Mahmoud Ahmadinejad of Iran, center, at a highway tunnel near Tehran. Much of Iran's atomic work is also in tunnels." Wow, that's the first reaction I had to the photo today upon seeing it. I vaguely remember seeing the exact photo, or one like it months ago. Thank you for mentioning this, that's an odd thing for NYT to do. I'm waiting for David Pogue to post a 300-word diatribe to declare that the photo is fair use and he did nothing wrong. Sounds like something that Fox News has the habit of doing. I, too, wondered about the background/history of that photo. Thinking continentally on fair use, is trashville allowed to freely slap NYTmag photos?